Fans who tuned into “The Defenders” after it dropped at midnight on Friday — and finished it — got a big treat in the form of the first teaser for “The Punisher” series. The 80-second video shows the titular character, named Frank Castle (and played by Jon Berenthal), smashing the ground with a hammer and looking back on what got him to this point. If you’re unfamiliar with the Punisher origin story, it usually involves Castle turning to vigilantism after the death of his family. Audiences saw a lot of this in “Daredevil” Season 2, where Castle was introduced as a moral and physical rival to Matt Murdock. Netflix has been keeping details of the character’s solo spinoff series under wraps. We know that Deborah Ann Woll, who played Karen Page in “Daredevil,” will be reprising her role. Ben Barnes and Ebon Moss-Bachrach will be joining the cast. The teaser still doesn’t say much about what’s to come for Castle, but it does drop a line that might be of value. “The past is more than memories, it’s the devil you sold your soul to. He’s coming to collect,” Castle says as memories flash before his eyes. At the end of the teaser, we find out he’s been carving the Punisher symbol — the iconic skull — into the ground. 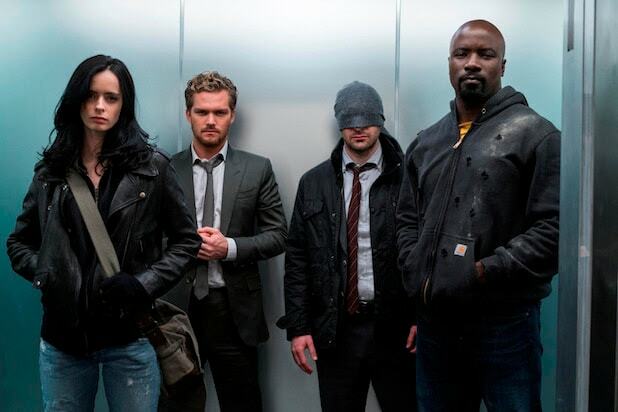 Just like Marvel films, the Marvel television shows tend to follow with the after-credits pattern, teasing upcoming episodes or projects in teasers or in small scenes (“Agents of SHIELD” does this too). While Netflix announces which seasons it’s tackling ahead of time, many of the first teasers have been released on the platform following the end of a show. “The Defenders” was no exception. There’s still no premiere date set, although the end of the video says it’ll premiere sometime in 2017. Watch the full teaser above.